French hens and golden rings are nice, but you aren’t going to see any of those on your road to adoption. Instead, you will get mountains of paperwork (which really wasn’t as daunting as I thought it would be) and a surge of adrenaline that will start the day you file that paperwork and end . . . well . . . never, I’d imagine. Oh, and in some states, a tuberculosis test. I had to have two, as if it were the 1800s and I was getting ready to ford the river on the Oregon Trail. And, eventually, you will get a new family. 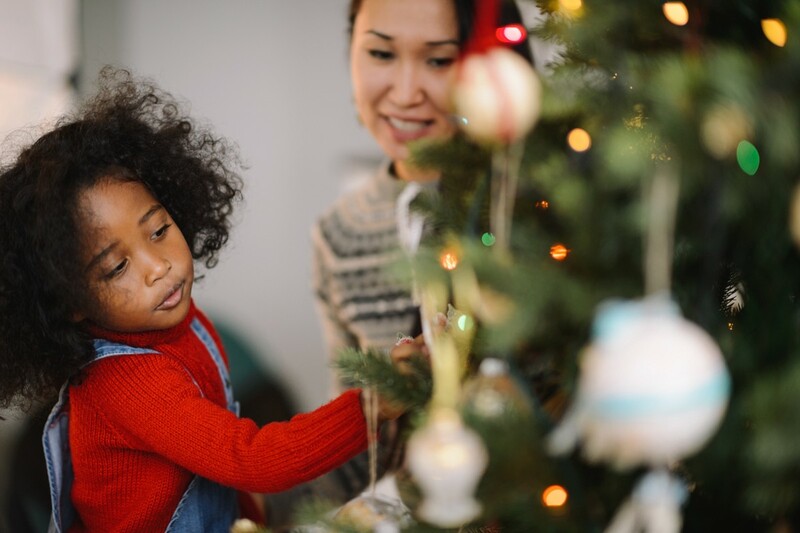 The Christmas after I decided to become a mother was filled with thoughts of what my child might look like, what we might be doing the following Christmas, and what on earth the next year would hold. My mom and I talked about our growing family as we decorated the tree. My mom has an ornament that she got the year before I was born. It was a little girl, a blonde angel sitting in a nut. My mom said she knew when she saw that ornament she would have a child just like that (the little blonde angel, not the nut). As is our Christmas tradition, she told me the story of that Christmas before I was born. To imagine the future with my own child was both exciting and nerve-racking, especially as a Solo Mom-to-be. One year later, I was holding my new son—fresh out of the neonatal intensive care unit (he arrived 11 weeks ahead of schedule)—feeling all the feels. I got up with him early on Christmas morning, turned on the fireplace, and rocked him by the Christmas tree. I just stared at this little miracle. He stared back at me. And then, he smiled. On the first day of Christmas, my true love gave to me: a baby in a gender-neutral onesie. On the second day of Christmas, my true love gave to me: two postplacement visits and a baby in a gender-neutral onesie. On the third day of Christmas, my true love gave to me: three copies of my homestudy, two postplacement visits, and a baby in a gender-neutral onesie. On the fourth day of Christmas, my true love gave to me: four sets of fingerprints, three copies of my homestudy, two postplacement visits, and a baby in a gender-neutral onesie. On the fifth day of Christmas, my true love gave to me: five bottles of Xanax, four sets of fingerprints, three copies of my homestudy, two postplacement visits, and a baby in a gender-neutral onesie. On the sixth day of Christmas, my true love gave to me: six plane tickets, five bottles of Xanax, four sets of fingerprints, three copies of my homestudy, two postplacement visits, and a baby in a gender-neutral onesie. On the seventh day of Christmas, my true love gave to me: seven trips to FedEx, six plane tickets, five bottles of Xanax, four sets of fingerprints, three copies of my homestudy, two postplacement visits, and a baby in a gender-neutral onesie. On the eighth day of Christmas, my true love gave to me: eight unsolicited opinions, seven trips to FedEx, six plane tickets, five bottles of Xanax, four sets of fingerprints, three copies of my homestudy, two postplacement visits, and a baby in a gender-neutral onesie. On the ninth day of Christmas, my true love gave to me: nine photos with the judge, eight unsolicited opinions, seven trips to FedEx, six plane tickets, five bottles of Xanax, four sets of fingerprints, three copies of my homestudy, two postplacement visits, and a baby in a gender-neutral onesie. On the 10th day of Christmas, my true love gave to me: 10 panicked phone calls, nine photos with the judge, eight unsolicited opinions, seven trips to FedEx, six plane tickets, five bottles of Xanax, four sets of fingerprints, three copies of my homestudy, two postplacement visits, and a baby in a gender-neutral onesie. On the 11th day of Christmas, my true love gave to me: 11 inappropriate questions, 10 panicked phone calls, nine photos with the judge, eight unsolicited opinions, seven trips to FedEx, six plane tickets, five bottles of Xanax, four sets of fingerprints, three copies of my homestudy, two postplacement visits, and a baby in a gender-neutral onesie. On the 12th day of Christmas, my true love gave to me: 12 therapy sessions, 11 inappropriate questions, 10 panicked phone calls, nine photos with the judge, eight unsolicited opinions, seven trips to FedEx, six plane tickets, five bottles of Xanax, four sets of fingerprints, three copies of my homestudy, two postplacement visits, and a baby in a gender-neutral onesie. Just remember, for every panicked phone call, there are those times your baby will smile at you. And for every trip to FedEx and every anxious plane ride, there are many more times you will hear “I love you, Mommy.” As my son and I prepare for his best Christmas yet, I think back to that crazy, wonderful, terrifying—let’s be honest, insane—roller-coaster ride and know I’d do it all over again.